There is a quiet and watchful audience before we fill our feeders with seed. The anticipation of the surrounding birds grows as we walk away. 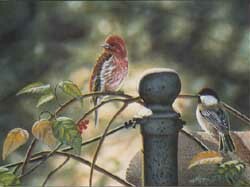 Generally the chickadees, the bravest birds, will come to dine first. When it seems safe, the rest will follow. 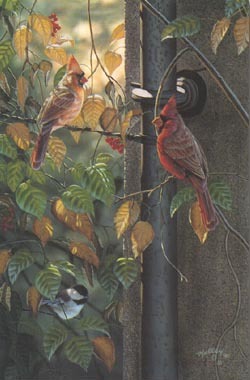 We take the time to observe the beauty of The Gathering of songbirds that come to take part of the feast we laid out for them. Signed Top Panel 10" x 7½"